On September 15/16 the Dutch RS Aero 7 class event was held in conjunction with the Open Dutch Championship for RS Feva and Open Class Championship for RS500 classes. 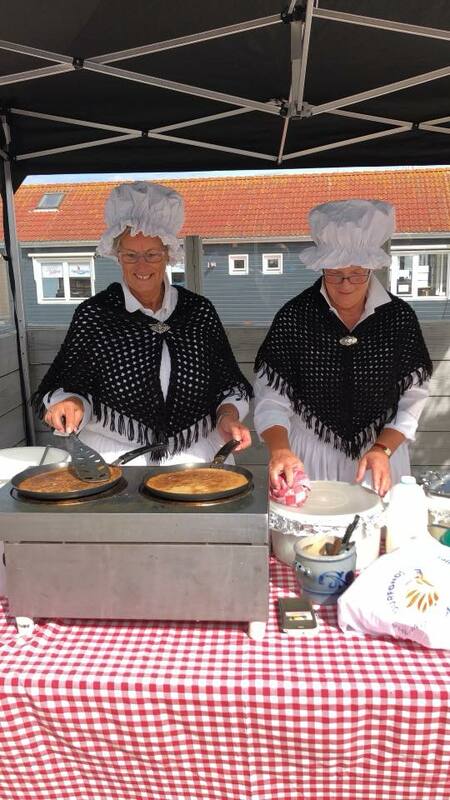 The event was organized under the auspices of the Royal Netherlands Watersport Association at Aquavitesse, Bruinisse. After registration and receiving a nice RS goody ‘dry’ bag, the event briefing was held where we were treated with Zeeuwse Bolussen, a nice local pastry. A total of 10 RS Aeros signed up but two couldn’t join unfortunately so 8 Aero 7 rig sailors started on Saturday. Sailing conditions at Day 1 were great, a nice south-westerly 3-4bft, temperatures in the low 20’Cs and always a pleasure to sail at Europe’s largest salt water lake with it’s crystal clear waters. The course was an Olympic trapezoid with an inner and outer loop. The Feva’s started first sailing the outer loop, followed by the RS500’s and RS Aeros sharing the inner loop course. While sharing the same course, the RS Aero fleet frequently split up either side of the loop during the upwind leg to avoid the impressive downwind surfing RS500’s to avoid their foul wind and choppy waters. This lead to interesting results from totally spread out to ending up at the gates at the same time. After the first race Karlijn was so dedicated to make a great start that she just crossed the line seconds early and resulted in an OCS. Unfortunately Sim had a brief affair with his boom and decided to call it a day after two races. 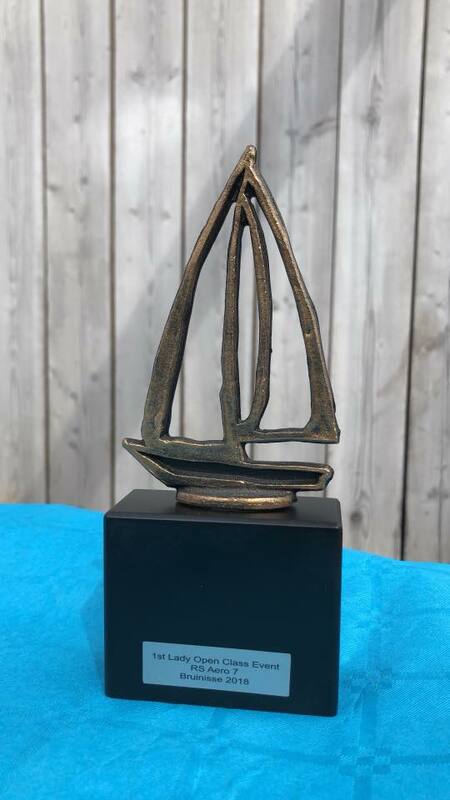 Day 1 gave us nice competitive battles between the sailors resulting in a musical chair for first, second and third places over the first four races. Results after Day 1: 1st Sander de Jong, 2nd Maarten Oelering, 3rd Jan van den Brink. The day ended with the known Dutch RS party socials with DJ, Burgers, local Mussels and well deserved beers! At Day 2 the first warning signal sounded sharp at 09:55 and with the same sequence; Fevas, 500’s and Aeros. Again great conditions, a bit less wind, a little warmer and Sim joined the fleet again. Unfortunately Sander couldn’t join to defend his leading position. All fresh and you could notice the difference in competition as all were sailing more in ‘full competition mode’. Still sharing the same course with the RS500’s resulting in more on the edge tacks and some friendly call out warnings to give way. The race officer directed the three Class fleet in an impressive way and again managed to start 4 more races with a military precision. 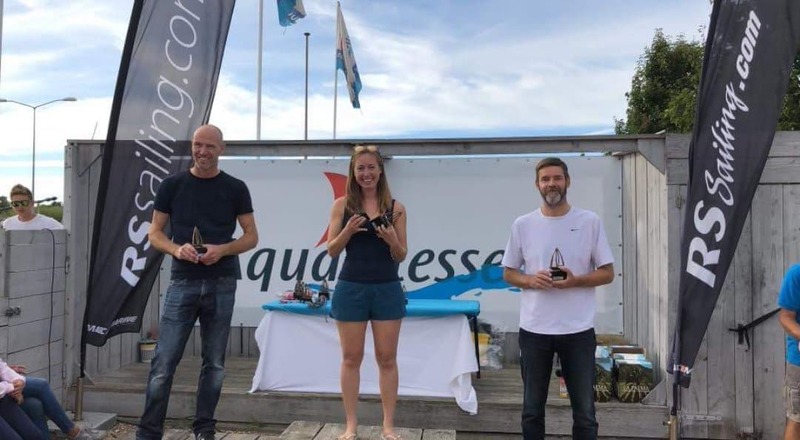 With finishing five out of eight races as first, it was obvious that Karlijn was leading the scoreboard, not only for being the best female but most of all being the best out of the eight RS Aero sailors – her second event win this year! 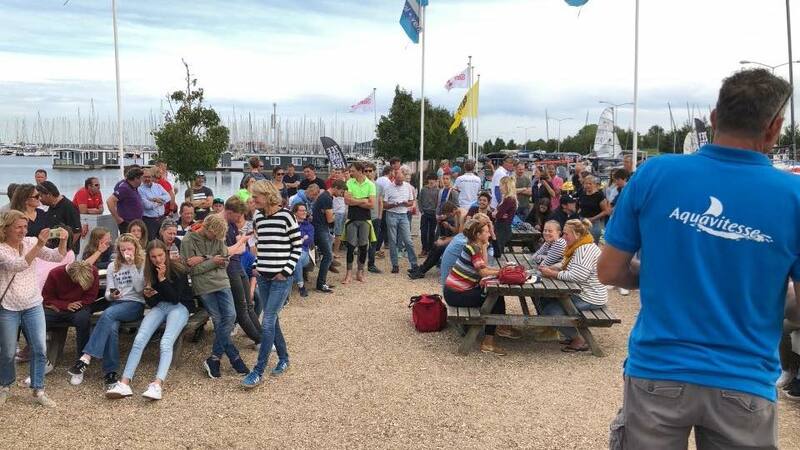 A big thanks to Zeilclub Kurenpolder, Aquavitesse and all who gave their support for organizing this great event which came with super conditions at the Dutch home of RS sailing. I sincerely hope that this event will be scheduled again for 2019 and that the RS Aero fleet will continue to grow steadily. Therefor a call out to all international RS Aero sailors: join us next year at this wonderful venue so we can find at least 20 (maybe 30!) RS Aeros at the start! again at Bruinisse on 6/7 Oct, a week after the RS AeroCup International RS Aero regatta in La Baule, France.